Home Articles Can Kinesiology Tape Prevent Foot Blisters? Blisters are one of the most common complaints among even seasoned marathoners, hikers, and others who spend hours on the move. Many runners finish competitions with painful blisters that leave them barely able to walk. Not surprisingly, marathoners have shared lots of blister remedies and prevention tips online. We were interested to recently read comments on several blogs that specifically mention kinesiology tape as a preventive measure. No one in the industry is in a position to say tape will prevent blisters but anecdotes indicate KT is emerging as an anti-blister strategy. Do Blisters Serve a Purpose? Blisters form when skin is subject to constant friction or exposed to freezing temperatures, burns, and chemicals. They may appear over skin infections. And yes, they do serve a purpose: they cushion the skin against the offending surface or contact. The edge of the ball of the foot is a common blister site; sometimes it develops under or next to a well-formed callous. Blisters are filled with plasma or serum, which helps develop new skin and connective tissue. They act like little pools for cell development and are absorbed as the area heals. For this reason, most blisters should be left alone and covered with a band-aid. They can, however, become infected so keep an eye on them as they heal. Blisters will happen even to the most skilled and experienced marathoners so no, no one can say they can keep them from forming. But you can take steps to prevent them from forming early in a competition. The first and most obvious step is to wear shoes that fit you well. Keep in mind that the brand you wore in your 20s may no longer do the job in your 40s. Feet change over time: pregnancy, weight gain and loss, and natural changes in ligaments and tendons will affect your foot shape. Shops that specialize in fitting runners for shoes are good places to consult about what brand is best for you. Second, make sure you’re wearing the right socks with those shoes. Nylon socks work best because they let the feet breathe so there’s less moisture from sweat. Socks made from wicking material pull moisture away from the feet. However, these materials often contain wool, which some people find uncomfortable. Make sure your socks have reinforced toes and heels. Some runners swear by wearing socks inside out. Taping the Feet. Duct tape has long been a favorite because of its perceived strength and sticking ability. Many people complain that it rubs off after several miles. Runners have also tried padded tapes with the same results. Kinesiology tape is getting chatted up lately, probably because they adhere better to skin and are more water resistant than duct tape. Target Tape® has an acrylic adhesive that resists moisture and raises and lowers skin layers to increase blood flow to speed up healing. Perhaps this can interrupt or at least slows the process of a blister forming. Regularly use foot powder and creams. Don’t wait until the day before a competition to consider the condition of your feet. Preventive care works! There are several anti-blistering compounds on the market. Many runners swear by plain old Vaseline. Of course, skin must be completely dry to apply any tape, including TT Target Tape. If you do decide to tape over an existing blister, be sure it’s dry, too. We came across a blog that recommends cutting a tiny hole in the tape over the blister to allow it to drain. What do you do to prevent blistering when running or hiking? Share your thoughts and experiences with us on Facebook or send us an email. Photos and videos are welcome! 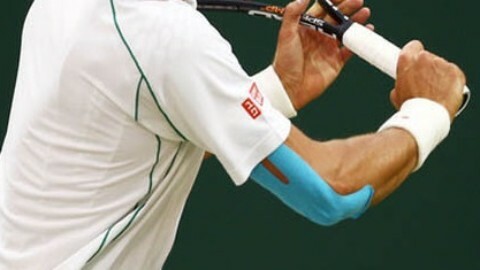 Tape Up & Treat 7 Common Sports InjuriesElbow Injury Isn't Funny!